Most varieties of figs can be raised and ripened in short growing seasons if grown in pots and stored in a garage or basement during winter. The most early ripening, flavorful, and productive cultivars perform best. 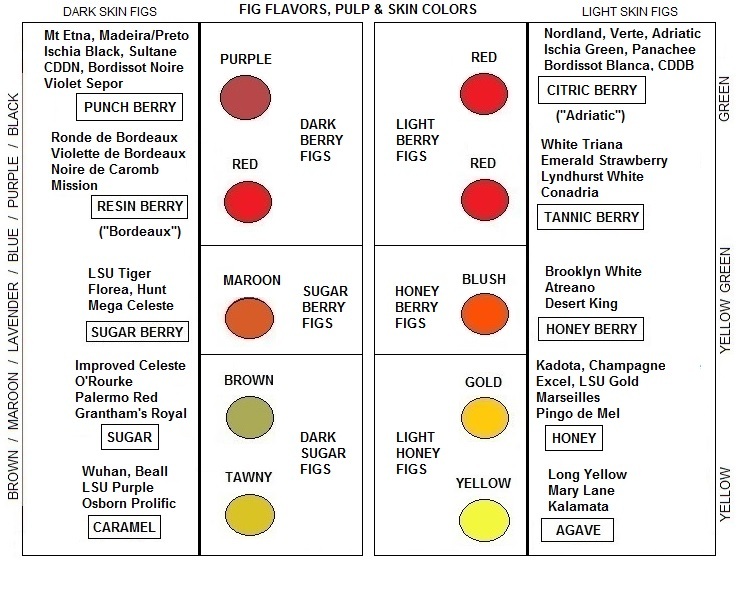 A baker’s dozen of optimal varieties could include: Mt Etna (by many names), Ronde de Bordeaux, Brooklyn White, Florea, Longue d’Aout/Nordland, Marseilles, Violette de Bordeaux (by many names), and the LSU cultivars: Improved Celeste, O’Rourke, Tiger, Purple, Gold, and Scott’s Black. These 13 cultivars cover the flavor and color spectrum and can be prolific producers with great flavor in short growing seasons. Violette de Bordeaux and Scott’s Black pack perhaps the most intense flavors of this group, and are also the latest ripening. Florea is very early ripening, as are Ronde de Bordeaux and Improved Celeste, which are two of the most prolific cultivars along with Mt Etna, O’Rourke, and Tiger. The yellow-ripe Brooklyn White and the green-ripe Longue d’Aout (Nordland) are two of the biggest figs of this group, both very flavorful and productive. LSU Gold is a big bright honey fig, and LSU purple is a productive dark fig that can taste like maple sugar candy when fully mature. Marseilles is a reliable and shapely yellow honey fig. Add a couple of odd, fun figs like the clownish looking Violet Sepor and the very bright tangerine-like Mary Lane, both very flavorful, and that’s a fabulous 15 figs. Adding Long Yellow for its big globe size and shape, its brightness and its light agave nectar flavor, plus Black Madeira for a premier intense flavor, and Paradiso (Ischia Green) for a striking green/red look and flavor intensity as well provides an excellent 18 varieties that show the tremendous diversity and bounty that figs can offer to dooryard growers, even in relatively short growing seasons. In addition to main crop figs, which fruit on the season’s new growth, a limited number of breba crop, or first crop, figs can ripen up to a month before the earliest main crop figs on the buds of the previous year that did not produce figs. Under optimal conditions, breba figs can often rival the quality of main crop figs though sometimes are inferior. After a long winter or off-season, even in limited quantities, the relatively early arrival of breba figs are greatly appreciated. A few good quality breba cultivars include the Violette de Bordeauxs, the Kadotas, Desert King, the Marseilles, the Palermo Reds, Lattarula, Grantham’s Royal, and one of the best: San Miro Piro.